"I love PURPLE TIGER! I can wear my jeans that I haven't been able to fit into for years!" Purple Tiger has everyone talking. Increased energy, decreased appetite and powerful weight loss. "I lost 90 pounds with Purple Tiger. I'm a new person!" "I can't believe the difference in how I feel from just taking Purple Tiger for a few days. I'm just not that hungry and I don't want to snack all the time." "Purple Tiger helps me to stay focused and it really curbs my appetite for sweets. I've lost 60 pounds and back down to a size 12." Many are seeing increased weight loss by taking Thyroid Complex. There are 7 different Purple Tiger formulas. Why so many? Because everyone is different. What works for one, may not work for another. With different formulas, you can "team up" and use more than one formula at a time. Gone Wild in the morning, Going Green in the afternoon and the NEW Purple Tiger Burn before each meal! Formulated by a naturopathic Doctor, the Purple Tiger series is taking the weight loss and energy industry by storm. 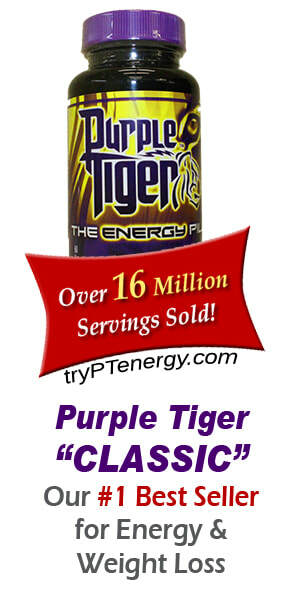 Made from all natural ingredients, Purple Tiger makes a great choice for your energy and weight loss needs. Lose weight while you sleep with Purple Tiger PM. Wanting a bit higher energy, weight loss and appetite control? Try Purple Tiger Gone Wild ! If you've tried Purple Tiger and the Gone Wild formulas and want even more, then try Purple Tiger RIPPED. Extreme 8 hour energy in this fat shredding formula. Maybe you want a lower energy with a high FAT BURN. Then Purple Tiger Going Green would be a great selection for you. NEW "caffeine free" Purple Tiger BURN. Add it to your routine of one of the other formulas above for MAXIMUM fat burning! Purple Tiger Burn testimonies.